Bruce Lee is an unusual game from WMS, the part that is different coming from the way the layout of the game is made, with the initial reels being smaller, while the last ones are bigger than normal. The theme is obviously inspired by Bruce Lee, the actor and martial artist, and by the various weapons that he used at one point or another. The game’s Chinese inspiration is easy to recognize. 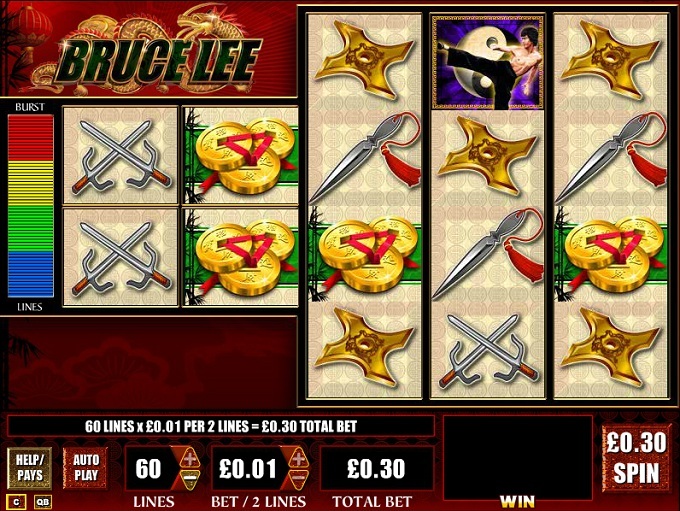 Despite the weird layout used on the 5 reels, the game manages to offer 60 paylines. 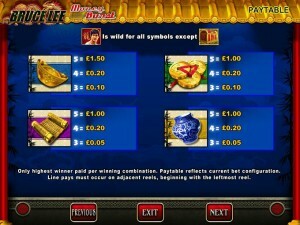 It also gives you access to all kinds of free spins, to scatter symbols and wilds. Unfortunately, the top prize is worth only $800. 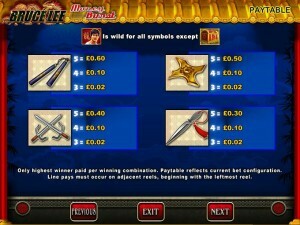 The game’s feature list has on it the wild symbols, scatters and free spins. It’s not a very complicated list of features, but the game is different in other ways, mostly layout wise. The layout of the 5 reels is the first unusual part about this game. You have the first two reels with two symbols each, while reels three, four and five have four symbols each. You get a total of 60 paylines out of this slot machine. You see Bruce Lee, with a red background behind him, in the symbol which acts as the wild in the game. It’s your typical wild symbol in most respects, able to substitute for pretty much all the symbols with the exception of the Treasure Chest scatter. Since it appears on all reels, it can also form its own combinations, provided that you get three to five icons of the same type and on the same payline. The reward will reach a maximum of 400x. The symbol which brings you the free spins is the Treasure Chest scatter, which can appear anywhere on the reels. You can get a few different outcomes from this game, with the help of the scatter. The minimum number of free spins is 5, and you need three scattered Treasure Chests to get this amount. Get four scatter symbols, on the two small reels from the beginning, and you will win 5 free spins, during which the wild symbols are locked in place until the feature is over. Retriggering this feature is done with the last three reels having scatter symbols on them. Finally, you can get a round with 20 free spins from the slot, if you happen to land four scatters on the first two reels, plus three scatters on the last three. You get a wild reel for the duration of the free spins, without a chance to retrigger the feature. One of the things I enjoyed about this slot is that you only need one coin to cover two lines, so for the 60 lines there are only 30 coins in the wager. Each coin has a value of up to $2, with a minimum of $0.01. The bets go as high as $60. 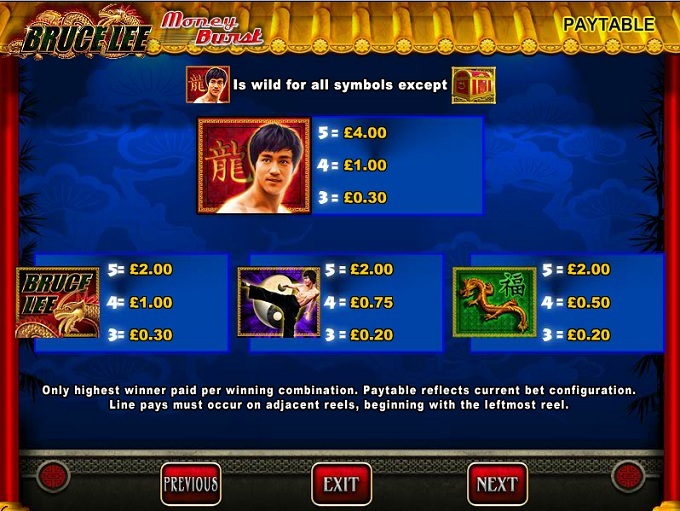 The Bruce Lee wild is responsible for the big prize being offered, and its maximum value is 400 coins, or $800. 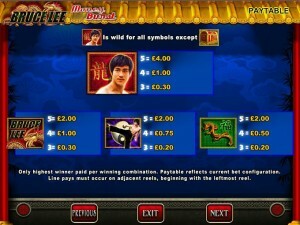 It’s an officially licensed slot machine, so you will find photos of Bruce Lee that are integrated in some of the symbols which are used. Other symbols include various Chinese items and weapons. The game focuses on martial arts and on the Chinese look, with a pagoda like roof above the reels and with dragons being often used in the game’s symbols. Symbols: Bruce Lee (400 coins, wild), Treasure Chest (scatter), Bruce Lee Logo (200 coins), Bruce Lee Kicking (200 coins), Dragon (200 coins), Gold Ingot (150 coins), Gold Coins (100 coins), Gold Scroll (100 coins), Blue Vase (100 coins), Nunchucks (60 coins), Throwing Star (50 coins), Trident Weapons (40 coins) and Dagger (30 coins). Whether you’re a fan of Bruce Lee’s movies or not, there is no denying that he was a great actor and a big influence on the martial arts movie genre. The game is quite good on its own, but it doesn’t hurt that it also has the official license. Born in 1940, under the name Lee Jun-fan, he lived a relatively short life, dying in 1973, on July 20th. He founded the Jeet Kune Do style, he was a film actor, an instructor of martial arts and a filmmaker, among other things. Many consider him to be one of the biggest influences on the martial arts style from all times. His movies helped make the entire genre popular, with Chinese martial artists gaining a lot of influence in the US thanks to him. Some of the movies that he is better known for include The Big Boss, Game of Death or Fist of Fury. 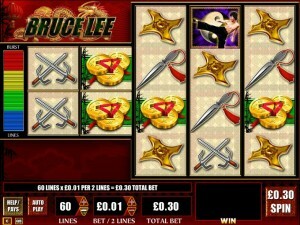 Bruce Lee can be found at any WMS casino, where you get a chance to play it for real money or in free mode.